Losartan side effects may include dizziness, muscle cramps, heartburn, stuffy nose and other cold symptoms, numbness to touch, and back pain. More serious side effects include impaired kidney function, difficulty breathing, chest pain, hives, arrhythmia, and swelling of the extremities. Losartan can have severe adverse effects if ingested by pregnant women, particularly after the first trimester, so should be avoided in these cases. Some of these side effects, such as anemia and fatigue, are more common in patients taking losartan for kidney disease than in those taking the drug to combat hypertension. Cold symptoms, on the other hand, are more often found in those taking the drug as a treatment for high blood pressure. Anyone suffering from any of these conditions should contact their physician immediately, as the above side effects may be a sign of an allergic reaction to the drug. 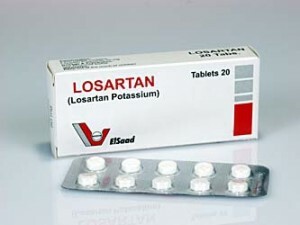 Some of the most serious side effects of losartan may actually signify an overdose of the drug. These adverse effects include dangerously low blood pressure, irregular or increased heart rate, kidney and/or renal failure, and loss of consciousness. Once the drug is absorbed into the body, there is no “cure” for the overdose (in other words, the drug cannot simply be removed from the body). The primary course of action is to treat the symptoms arising from the overdose by providing intravenous fluids, monitoring major organ function, and ensuring blood pressure stays constant. There are few gender-specific side effects to losartan use. However, women who are pregnant or may be pregnant should avoid this drug, as it may cause miscarriage or birth defects. Losartan is especially dangerous to the fetus if used at any point during the second or third trimester of pregnancy, and can cause advanced-term miscarriages or stillborn deliveries. Because of these dangers, it is also not advisable for women who are breastfeeding to take losartan, as it may be passed onto the infant in potentially dangerous levels through breast milk. Weight fluctuation is not a commonly reported side effect of losartan. Approximately 4% of patients taking the medication as a treatment for kidney disease reported weight gain—a small enough percentage that it is almost impossible to conclude that this weight change is related directly to losartan use. Weight gain has not been recorded as a side effect for those taking losartan to treat high blood pressure. However, rapid weight gain (which amounts to over five pounds gained per week) may signal congestive heart failure, and should be addressed immediately. Losartan has been approved for use by the FDA since 1995, and is safe for almost anyone suffering from hypertension or kidney disorders like diabetic nephropathy—including children as young as six years old. Pregnant women are the primary exception to the rule. Of course, anyone with a preexisting medical condition may be more susceptible to serious side effects, and should discuss the losartan treatment with their physician.